West Chichagof-Yakobi Wilderness on Tuesday July 23rd. 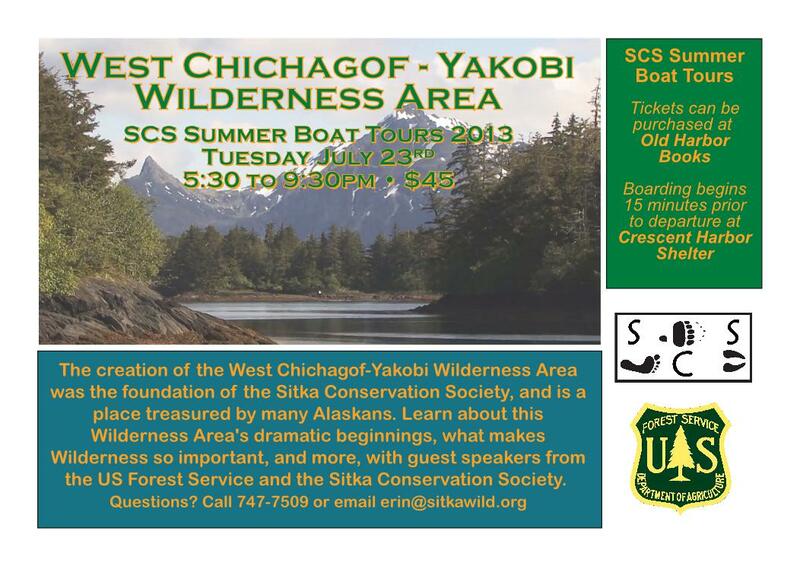 This special tour will take place on Tuesday July 23rd, from 5:30 to 9:30pm. TIckets can be purchased from Old Harbor Books 201 Lincoln Street for $45 or (if available) at the Crescent Harbor loading dock at time of the cruise. It is suggested that tickets be purchased in advance to assure participation. Boarding begins at 5:15 pm. at Crescent Harbor. Due to the discounted rate of this trip, we are unable to offer additionally reduced rates for seniors or children. Mark your calendars! 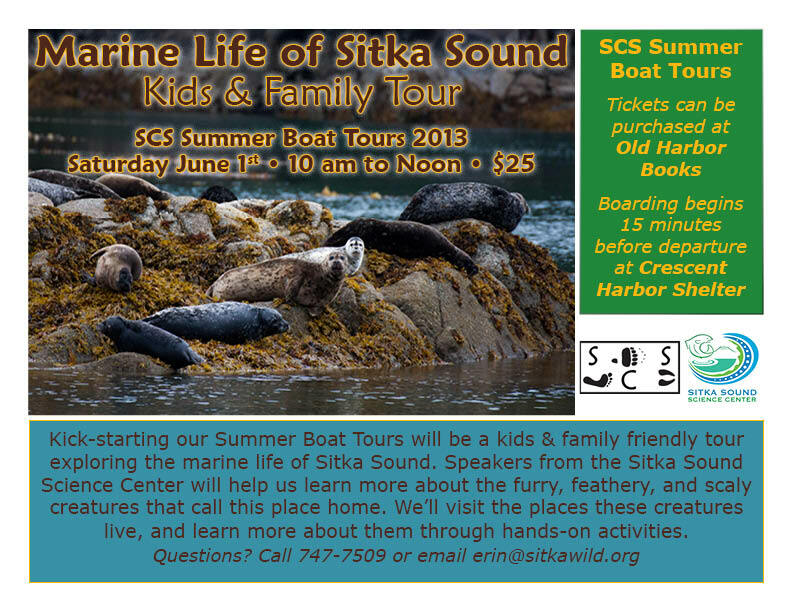 The next tour in our Summer Boat Tours series will be exploring the History of Sitka Sound on Thursday June 27th. We’ll be exploring the islands, forests and waters of Sitka Sound and learning about the rich history of this amazing place: how it has shaped the lives of those who’ve called Sitka home, and how Sitka Sound has been shaped in turn. 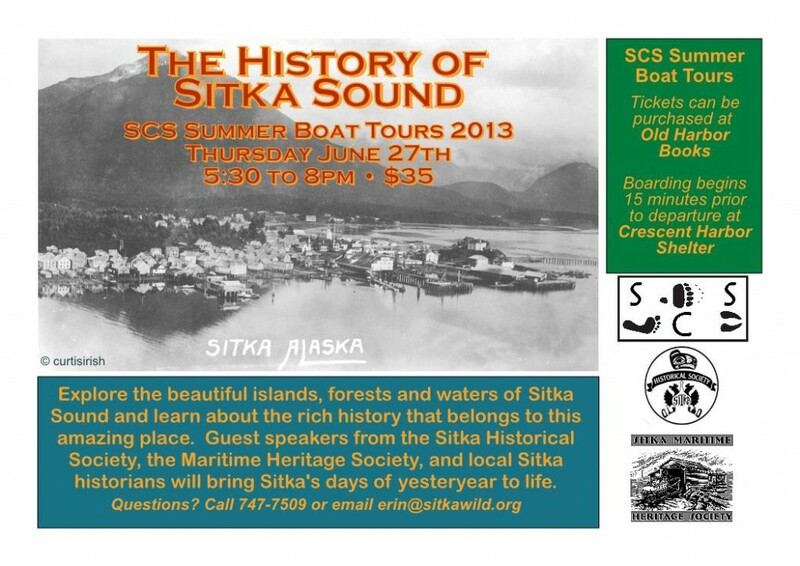 Guest speakers from the Sitka Historical Society, the Sitka Maritime Heritage Society, as well as local Sitkans with a love of history and unique knowledge of this amazing place will help bring the days of Sitka’s yesteryear to life. Boarding for the tour will begin at 5:15pm from Crescent Harbor Shelter, departing at 5:30pm, and returning home at 8pm. Tickets can be purchased at Old Harbor Books for $35. Any questions? Call 747-7509 or email erin@sitkawild.org. The first of six boat tours to take place throughout the summer. Mark your calendars! Check back soon for more information on tour topics and speakers. See you on the boat! A special thanks to Allen Marine for offering discounted charter prices for our non-profit summer tours, which makes this series possible. See new places, new perspectives and learn more about this wild place we live in! Ask anyone where the best salmon is caught, and they’ll answer: Alaska. Ask an Alaskan where the best salmon is caught, and they’ll answer: Southeast. The Wild Salmon fisheries of Southeast Alaska provides nearly 30% of the global supply of wild salmon. The 57,000 plus miles of rivers, streams, and creeks throughout the Tongass National Forest provides unparalleled spawning habitat for all five species of salmon: pink, chum, coho, sockeye and king. Neighboring rivers in British Columbia and in Southcentral Alaska, as well as the salmon released each year from hatcheries throughout Southeast, also contribute to the robust fisheries we have here. But just how many salmon caught each year are true Tongass Salmon: spawned and raised in waterways within the Tongass National Forest? 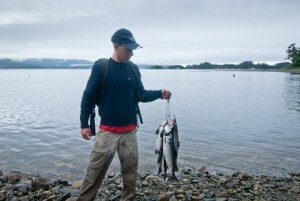 Ron Medel, the Tongass Fisheries Program Manager, found out just that. 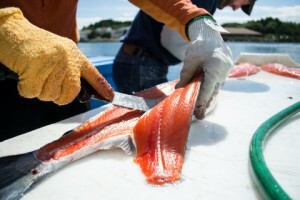 The Alaska Department of Fish and Game keeps a close eye on salmon throughout the state, and each year produce an estimate regarding how many landed fish come from hatcheries versus wild stocks. Fisheries data from British Columbia’s portions of the Stikine, Taku and other salmon streams were also considered and factored out of the Southeast total harvest. Combining all this data, utilizing the power of spreadsheets and some elbow grease… Medel extrapolated that about 79% of the annual harvest in Southeast Alaska are from wild salmon that originated from the Tongass National Forest. 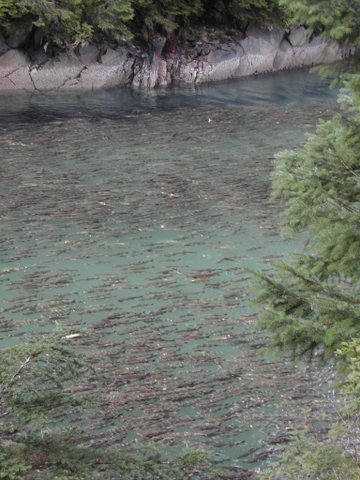 Even though the Tongass forest is such an important element in the Southeast Alaska salmon harvest, the US Forest Service has not allocated its funding and attention to the restoration and continued health of salmon spawning habitat within the forest. 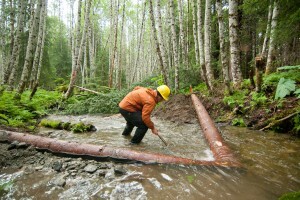 Only a small portion of their budget – only about $7 million out of the nearly $63 million budget – is spent on the fisheries and watershed program which directly impacts fisheries conditions and restores salmon habitat (timber harvest and road building receive $20 million). The health of the streams and watersheds that produce nearly $1 BILLION each year through commercial, sport and subsistence salmon harvesting is receiving so little support from the US Forest Service – what sort of salmon fishery would we have in Southeast Alaska if the Forest Service put more of their budget to supporting salmon and restoring all of the damage that was done by the historic clear-cut logging? Wild, Tongass-raised salmon may make up 79% of the salmon caught in Southeast Alaska each year, but those salmon forests, waterways, fisheries and markets need our support, our time, our energy, our concern in order to continue. Take action to encourage the Forest Service to put more support into stream restoration and watershed health! Your input is needed now to help Congress and the Forest Service prioritize where the American public wants to invest our tax dollars in public land management! Growing up in Minnesota, and having just spent the last three years in North Carolina, hearing or reading the term “public lands” brings to mind some pretty specific notions and memories, most of which include traveling a long distance, paying entrance or vehicle fees, rangers and managers who varied from enthusiastic to ornery, and usually lots of people. After living in Sitka for just over two months now, I’ve come to see public lands in a much different light. Sitka is nestled within 17 million acres of mountains, forests, streams and muskegs that comprise the Tongass National Forest. There’s no long expedition needed to reach public lands here – they’re in our backyards. They are our backyards. And these public lands are so much more than just a beautiful place to visit – they are the backbone to the communities of southeast Alaska. I did take a small excursion this past weekend, over to Kruzof Island. I was excited to actually travel the roads and see the forests, beaches, streams and muskegs I have spent so much time working with on the computer. Not to mention this was my first chance to see the Tongass off of Baranof Island. The purpose of this trip was two-fold: to ‘ground truth’ a number of forest stands and salmon streams for their current condition and their potential for restoration work, and to experience first-hand why Kruzof is such a popular and important place for Sitkans. I traveled with AmeriCorp volunteer Paul Norwood and SCS’s Watershed & Restoration manager Scott Harris over to Mud Bay. Once there, we anchored the boat, loaded up our gear onto our rented ATV’s, and headed west across the island to North Beach cabin (our ‘home base’ for the next couple of days). Already on the very first day on Kruzof, my idea of what “public lands” are started to shift. There I was, looking in awe at the beautiful forests and muskegs of north Kruzof as we roared along in our ATVs, all the while the other people we came across during our trip were there hunting deer with their families, starting to set out marten traps for the upcoming trapping season, and just enjoying the weekend out in the woods. While our trip didn’t include trap setting, I was able to experience deer hunting for the first time (a beautiful buck on our first day), ATVing through forests, up mountains and across rivers, hiking in streams and through muskegs, old growth stands and thick young growth, and strolling along Shelikof beach collecting sand dollars. All of these amazing and unique experiences, all in three days, all on a small section of an amazing island, and all on public land. As important and cherished as Kruzof is to Sitkans today, it still shows a landscape scarred from a less than kind history of extensive clear-cutting. Amid the tangle of young growth we climbed through were the moss-covered stumps of the giant trees that once towered there; streams barren of any logs or other diversions were lined with the blunted ends of old fallen trees that had been removed to allow for machinery to move easily upstream; mountain and hill-sides were blanketed in a mosaic of old growth, young growth, and veins of alder along the roads and trails. The scars are healing on Kruzof, but work is still needed to ensure that we can bring Kruzof back to it’s previous ecosystem health, allowing us and the countless animals that live there to enjoy the many riches of Kruzof well into the future. This trip showed me Kruzof Island as more than just a pretty view of Mount Edgecumbe: it is simultaneously a place for hiking, ATVing, subsistence hunting, fur trapping, restoration work on salmon streams and the surrounding forests, bird watching, beach-combing, quiet reflection, adventure… the list goes on. And all of this without any waiting in line at an entrance gate, or paying a visitor fee, or being constantly monitored by rangers and land managers. Believe it or not, this was the first time I had seen “the public” actually utilizing their public land. After all the visits I had made to public lands before in the lower 48, it wasn’t until coming here to Sitka, and seeing it first hand on Kruzof Island, that I really understood what public lands are really about. We are so fortunate here in southeast Alaska to not only to have this beautiful landscape as the backdrop of our lives, but to have that landscape as public land that we can visit for recreation and relaxation, and for our livelihoods. 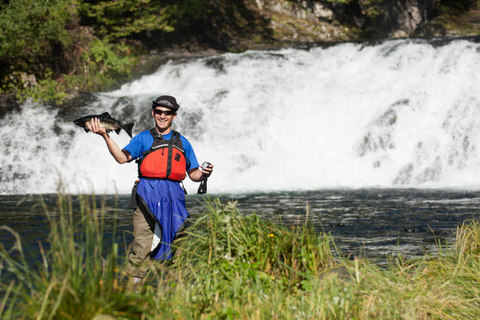 The fishing and tourism industries, which are the first and second largest employers and revenue makers in Sitka, are dependent on healthy forests, salmon streams, myriad wildlife, hiking and ATV trails, and cabins: all of which are found in our public lands. On Kruzof, these are places like Shelikof Creek, Iris Meadows, Twin Lakes, North Beach cabin, and so many more. 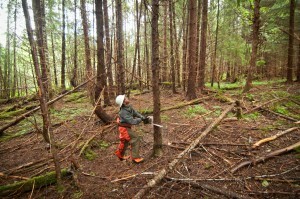 Yes, public lands like the Tongass National Forest are managed by tax payers’ dollars, but the money that the public pays to manage the Tongass is re-paid one hundred-fold. From the roughly 14 million dollars that the Forest Service spends on tourism and fisheries & watershed management within the Tongass, just under two billion (that’s $2,000,000,000!) is brought into the local economies of southeast Alaska from these two industries. And this number doesn’t even include the value of subsistence hunting, fishing and gathering. When I see Mount Edgecumbe on a clear day, or look out from atop Harbor Mountain, or hear the words “public lands”, a new array of memories and ideas come to mind. Public lands are for all people, for a profusion of different activities. They’re a gift and a legacy for all of us.